“Over the last couple of years, we have challenged ourselves by pushing boundaries, organizing events in extraordinary venues all over Amsterdam. Our main goal has always been to offer the visitors a unique experience. We have been fortunate enough to have a great working relationship with the progressive Amsterdam City Council, who have always been supportive of our ventures. However, working with these venues brings on extra risks as there are lots of factors to consider that one normally would not even have to think about. Due to newly revealed issues during the license application process beyond our control, we and the local authorities are not able to guarantee the safety at the Bijlmer prison anymore. Therefore we are forced to make the extremely difficult decision to cancel the Bijlmer prison events during Amsterdam Dance Event. We are fully aware that this is a major disappointment to everyone who has bought tickets and was looking forward to rave in a prison with us. We are with you and hope everyone understands that after months of hard work we did everything in our power to make this happen. canceling so close to the actual event is nowhere near how we envisioned it ourselves. We heard about this last week and have since tried to solve the issue on one hand and meanwhile search for alternative venues on the other hand. It turned out to be a mission impossible. We are discussing to promote new Bijlmer prison events for later this year or early 2019 when the current conditions that made us stop do not apply anymore. 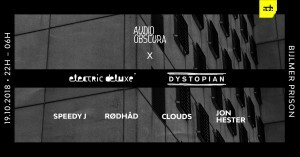 During Amsterdam Dance Event 2018, Amsterdams former Bijlmerbajes prison transforms into a special location for Audio Obscura x Electric Deluxe & Dystopian.